There are several mountain ranges in the Sahara that get snow regularly. It's not common anywhere else. In 1979 a snowstorm actually stopped traffic in Algeria. It was the first time that snow was recorded in the area. It melted in a few hours. It snowed in Algeria again in 2012. One half of the Sahara Desert receives less than .79 inches of rain each year. The rest of the desert only receives 3.9 inches per year. The Sahara covers large parts of Algeria, Chad, Egypt, Libya, Mauritania , Mali, Morocco, Niger, Western Sahara, Sudan and Tunisia. Its surface area of 9,400,000 square kilometers (3,630,000 square miles) including the Libyan Desert and covers about 1/4 of the African continent.It is comparable to the respective land areas of China or the United States. There are several species of fox in the Sahara, as well as antelope, gazelle, cheetah, monitor lizards, sand vipers, wild dogs and ostrich, among others. The Sahara is bordered by the Atlantic Ocean on the western edge, the Atlas Mountains and the Mediterranean Sea to the north, the Red Sea on the east, and the Sudan and the valley of the Niger River on the south. There are several underground water sources called aquifers. They sometimes reach the surface and form oases. Some of these are the Siwa, Kufra, Timimoun and the Bahariva. The Sahara has one of the harshest climates in the world. The Sahara used to be a lush region with many plants and animals.It began to dry up around 4000 years ago due to a gradual change in the tilt of the Earth’s orbit.Earth’s obliquity oscillates between 22.1 and 24.5 degrees on a 41,000-year cycle. It is currently 23.44 degrees and decreasing. The Sahara Desert is made up of sand dunes, sand seas, gravel plains, stone plateaus, salt flats, dry valleys, mountains, rivers, streams, and oases. Most of the streams and rivers in the Sahara are only seasonal. The main exception is the Nile River. It crosses the Sahara and empties into the Mediterranean Sea. There is sparse grassland in some parts of the desert including the highlands and northern and southern parts of the desert. The desert landforms of the Sahara are shaped by wind or by extremely rare rainfall and include sand dunes and dune fields or sand seas, stone plateaus, gravel plains, dry valleys, dry lakes and salt flats.Land formations change regularly. Many of its sand dunes reach over 180 meters (590 feet) in height. Several deeply dissected mountains and mountain ranges, many volcanic, rise from the desert. Emi Koussi (huge extinct volcano), a peak in the Tibesti Mountains is 3,415 meters (11,204 feet) high and the highest point in the desert. Wind and occasional rain are responsible for forming the landforms in the Sahara, which include sand dunes, dune fields, salt flats, and dry valleys. Land formations change regularly. Snow may fall occasionally in some of the higher mountain ranges.On Feb. 18, 1979, low altitude areas of the Sahara desert recorded their first snowfall in living memory. Snow fell in spots in southern Algeria.It snowed in Algeria again in 2012. The people who live in the Sahara are mostly nomads. Nomads move from place to place. Most of the rivers and streams in the Sahara desert are seasonal or intermittent, the main exception being the Nile River, which crosses the desert from its origins in central Africa to empty into the Mediterranean. There are some 20 or more lakes in the Sahara.Most of these are saltwater lakes. Lake Chad is the only freshwater lake in the desert. Some of the world’s largest supplies of underground water exist beneath the Sahara Desert, supporting about 90 major oases there. Goats and camels are the most common domesticated animals in the Sahara. Around two million people live in the Sahara Desert. Like all deserts, the Sahara harbors a relatively sparse community of wild plants, with the highest concentrations occurring along the northern and southern margins and near the oases and drainages. It has imposed adaptations on the plants. For instance, near wadis and oases, plants such as date palms, tamarisks and acacia put down long roots to reach life-sustaining water. In the more arid areas, the seeds of flowering plants sprout quickly after a rain, putting down shallow roots, and completing their growing cycle and producing seeds in a matter of days, before the soil dries out. The new seeds may lie dormant in the dry soil for years, awaiting the next rainfall to repeat the cycle. The Sahara Desert is made up of sand dunes, sand seas, gravel plains, stone plateaus, dry valleys, salt flats, mountains, rivers, streams, and oases. From the Mediterranean vegetation which covered the Sahara mountains before they became a desert, only laurel and cypress trees remain in the region near gueltas. Across the central, most arid part of the Sahara, the plant community comprises perhaps 500 species, which is extremely low considering the huge extent of the area. Date palm trees, introduced by Arabs, is requisite for the existence of humans in the oasis; dates are very energetic food, trunks are used to make beams, leaves are used to make baskets, ropes, mats and covers for huts,… its preserves fruit trees against the sun. More than 30,000 petroglyphs of animals native to rivers have been found in southeast Algeria in the Sahara. Camels are the main animal of the desert.They have a great capacity to resist heat and thirst. Even above 50°, they can stay without drinking water for many days.The camel is the favourite animal used by nomads.The second favorite animal for nomads in the Sahara desert is goat. There are sand dunes in the Sahara as tall as 590 feet. Several species of fox live in the Sahara, including the fennec fox, pale fox and Rüppell’s fox. Sahara means ‘the greatest desert' in Arabic. include the rhim gazelle and dama gazelle. It is the largest desert in Africa. The desert shrinks and grows depending on the climate. The northwest African cheetah, also known as the Saharan cheetah, is a subspecies of cheetah found in the northwestern part of Africa (particularly the central western Sahara desert and the Sahel). The Sahara Desert covers 3.6 million square miles. It is almost the same size as the United States or China. The Sahara Desert is the third largest in the world. The first two are Antarctica and the Arctic. There is also dung beetle which was a holy symbol to the ancient Egyptians and has some impressive adaptability. Saharan rock art is a significant area of archaeological study focusing on the precious treasures carved or painted on the natural rocks found in the central Sahara desert. There are over three thousand sites discovered that have information about Saharan rock art. The shifts in climate in the Sahara Desert are due to a 41000 year cycle. During this cycle, the earth changes its tilt between 22 and 24.5 degrees. There have been dinosaur fossils found in the Sahara Desert. Daytime temperatures can reach 58°C (136°F), but freezing temperatures are not uncommon at night. Its temperature can become as low as -6°C (22°F). 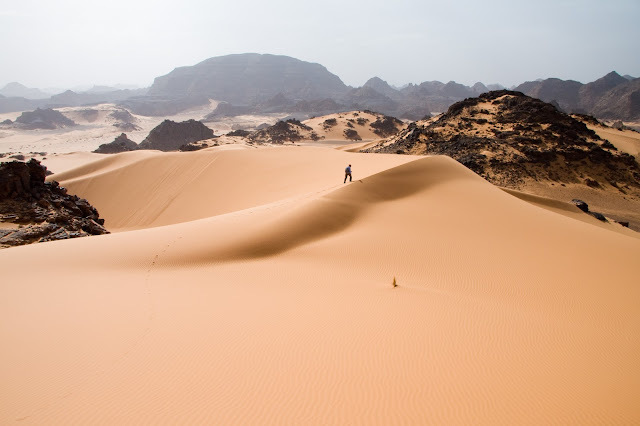 Half of the Sahara receives less than 2 centimeters (0.79 inches) of rain per year, and the rest receives up to 10 centimeters (3.9 inches) per year.The rainfall happens very rarely, but when it does it is usually torrential when it occurs after long dry periods, which can last for years. Sandstorms are very common in the desert.Brown clouds of sand cover the sky as wind blows sand everywhere. The word “Sahara” means “desert” in the Arabic language.